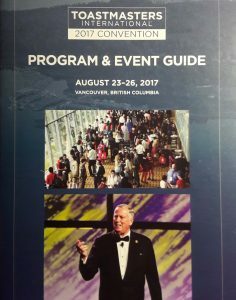 Over 3,000 delegates from 142 countries, 927 of us attending our first Toastmasters International Convention. Big numbers for the biggest event in the Toastmasters year, yet it felt cosily familiar. Educational presentations, keynote speakers, a contest and networking, but on a bigger scale – a much bigger scale. Despite its size, the gathering felt like being among friends. I met people from the US, Canada, China, Malaysia, Jamaica, Germany, Australia and many other countries. The friendliness was incredible, everyone making an effort to connect and exchange ideas and experiences about their clubs and districts. The speech semifinals were inspiring, sometimes moving, and a feast of stories and experiences. I attended three in one day – a total of 31 speeches – and admit to feeling emotionally exhausted but also uplifted by the end. Many of us conducted a personal assessment of each contestant’s speech using the judging criteria and the expertise left me in awe of the difficulty facing the judges in the face of such high quality speeches. 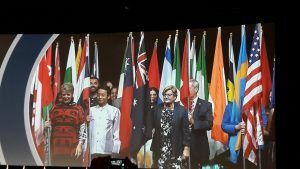 The World Championship of Public Speaking final set the bar at the highest level. Each finalist had to have TWO speeches, and delivered their second speech in the final. It’s hard enough to come up with one championship speech so the awe levels were tweaked up yet another notch. Such was the challenge facing the judges that no fewer than 25 were required. The 2017 Championship was awarded to Manoj Vasudevan, an Indian living in Singapore, who was a deserving winner. It was particularly thrilling that Simon Bucknall from Streatham in District 91 in the UK achieved second place. I met him in the street the following day and he was still in shock but absolutely delighted. He said he was overcome by the incredible support he had received, both at the convention and from his club and district. 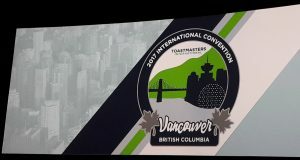 The Toastmasters International Convention was a fantastic event that opened my eyes to the sheer diversity, support, and friendliness of Toastmasters across the globe. An unforgettable experience. This entry was posted in Blog and tagged District 91, diversity, educational presentations, friendliness, judging, keynote speeches, Manoj Vasudevan, networking, public speaking, Simon Bucknall, Singapore, Streatham, toastmasters, Toastmasters International Convention, Vancouver, World Championship of Public Speaking. Bookmark the permalink.